I can’t find anything! I don’t know where to login? Need for a Social Media Policy?? What are the three levels of focus you talk about in your workshops? What do your workshops cover? Why would I need to do one when I can, like you say, find out anything I want to online? Why do businesses need to consider Social Media? Why do you guys think this should be all so serious? We have embedded one of our slide show presentations which provides a brief overview of our various sites and services. We firmly believe that social media goes far beyond the marketing, PR and sales generating focus which has remained at the forefront of the industry since its introduction to the main stream. In fact on inspection we believe that while not always recognised as such, social media cuts to the core of every business. Effective Social Media Policy & Planning requires accurate and relevant measures and reviews so that the needs of the business can be adequately fulfilled through the use of Social Media. We recognise the need for integrated and embedded approaches to social media regardless of context and aim to shift the emphasis from that of marketing and campaign management in the externally focused majority of many Social Media consultants. 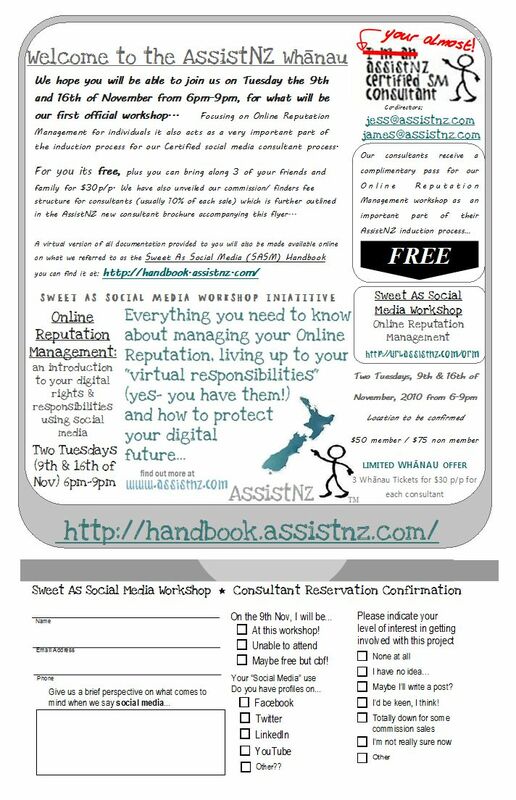 AssistNZ's specialises in Social Media Policy, Protection & Planning. Our services are customised to the various individuals, businesses and community groups we work alongside. We work in collaboration with others in our industry and across various arenas to ensure we are best equipped to help you with piecing together the puzzle of social media. Considering the various processes, functions and roles within your business, we categorise and consider three seperate and overlapping focus areas; internal, external and horizontal. Focusing only with concern to what is relevant & useful for you. proceed to login, it will appear you have no data.